and for nostalgia's sake....an advertisement. I’ll be watching this, I love these kits! Are you thinking of using the kit tires or something better? This is a great kit. 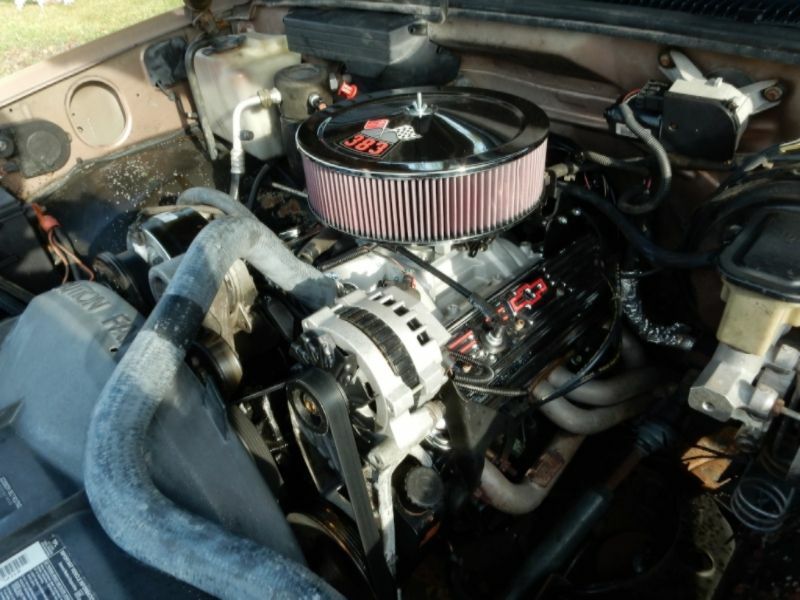 Like you I have owned a couple of the TBI 350's and even reworked the Throttle Body on my '96. As for the real SS454 trucks one of the reasons for the better acceleration had to do with the rear axle ratio. The earliest ones with the 3 speed automatic had 3:73 gears and the later 4 speed automatics got 4:10 gears. 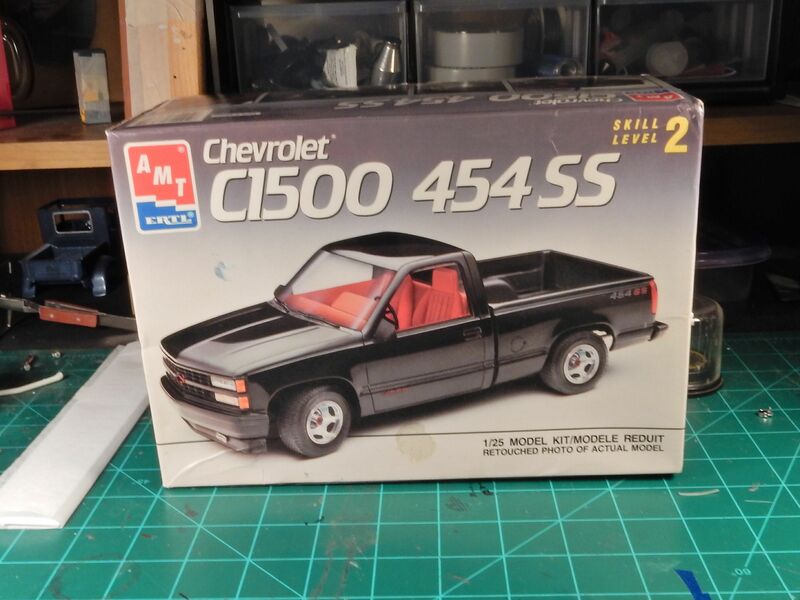 This kit builds up into a very accurate model of the truck. 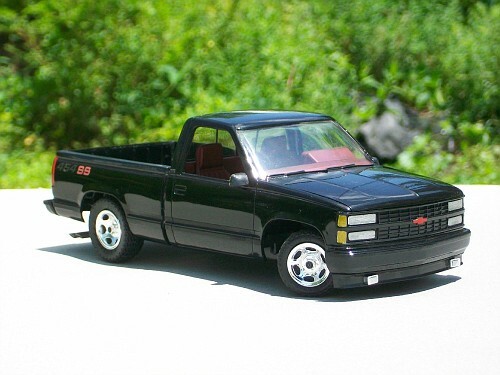 I love these trucks, and would do many immoral and unethical things to obtain a real one. In the meantime, I have two in the stash that I will eventually get around to building. This isn't just my fav generation of Chev truck, it's my fav truck period. 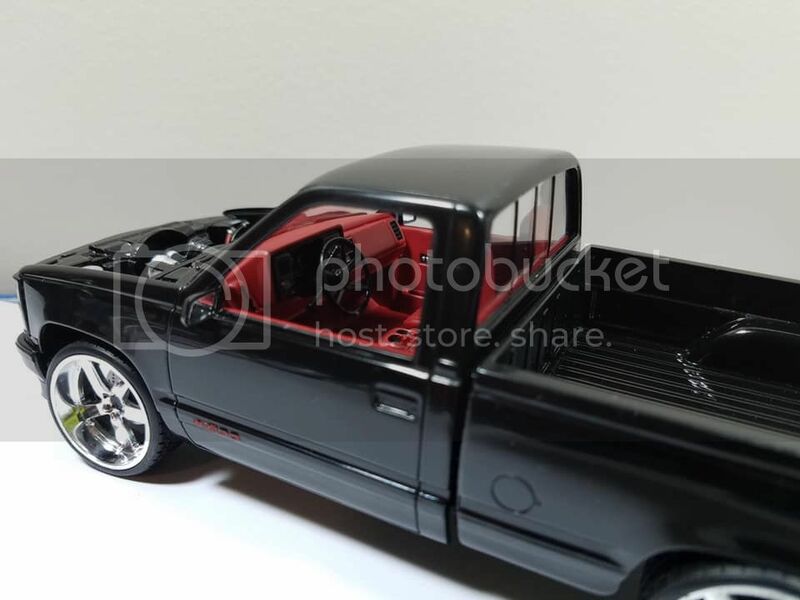 Love thses trucks.. still don't have this kit yet. I remember buying these for $5 at Wal Mart and Big Lots on closeout. Nice kit, still have a couple to build! Here's one I build when it first came out. Nice kit. FYI - Those wheels can used used for Chevrolet police wheels if you leave the center hub chrome, but paint the rest of the wheel semi-gloss black like I did on the MSP Tahoe. Thanks for the comments Jordan. I'm probably going to switch the tires out but use the stock wheels. I am currently looking for something that will work better. Thanks Dave. I'm looking forward to building it as I've got a good reference. Thanks Dan! I'm right there with you on these trucks. 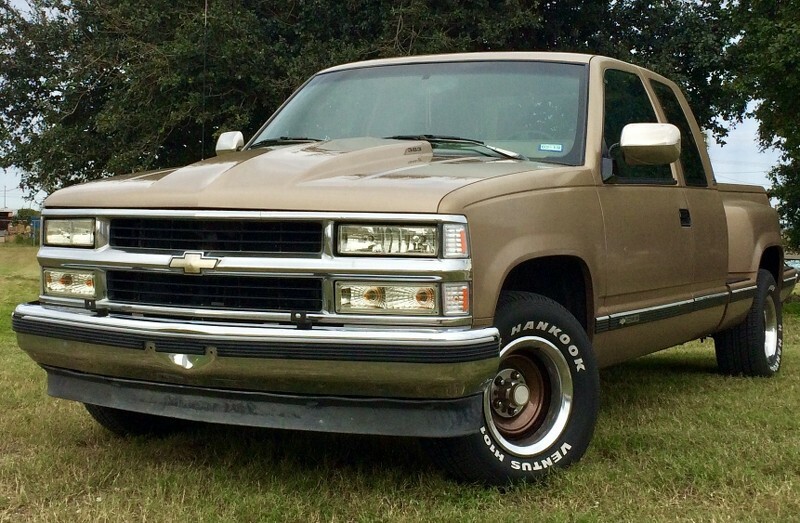 I worked on these things when they were brand new in the dealership and currently own 94 model extended cab stepside that I threw a warmed over 383 in with the 4L60E and some 3:90 gears. Fun truck. Thanks Andre. I just recently acquired this kit about 3 months ago and have been looking forward to building it. $5?? Wow!! THAT'S a deal right there! Thanks for the comments A.J. Good lookin' truck buddy. SHARP build Tyrone! I only got the one photo 3 times in your post. Do you have any more? Thanks for dropping in bud. Like Dan I'd love to get my hands ahold of one of these trucks in the 1:1 world. There's a few mods that can be done with the TBI setup. It's nothing like can be done with done with a multi port fuel injection setup with a MAF but it'll yield a lot more power nonetheless. Here's my truck that as of last Christmas got a 383 (that still utilizes TBI injection-but canned the TBI heads in favor of Vortec replacements) with a freshened up 4L60E, 2000 rpm stall converter and 3:90 gears. My stepson had a real one at the time. His did have the black centers in the wheels. That looks really good Keith. I'm looking forward to building mine even more. Thanks for the inspiration bud. 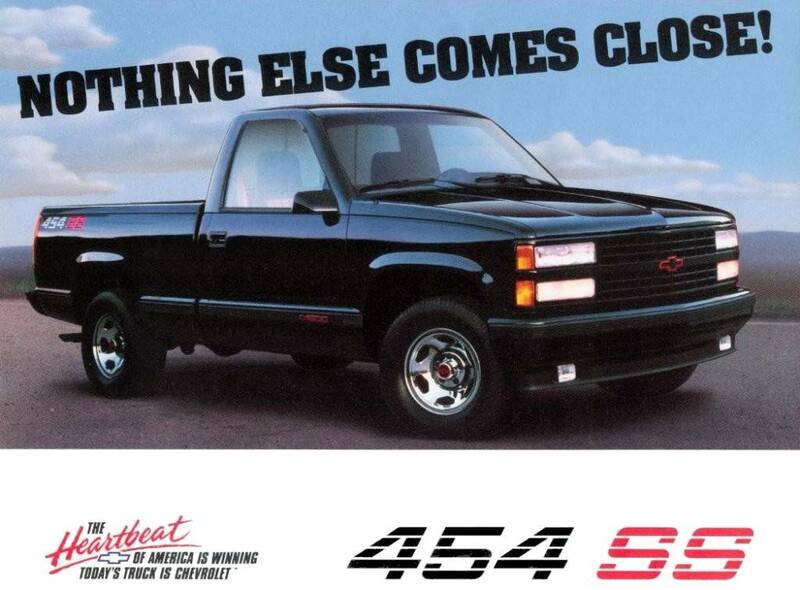 From a design perspective, I too agree this was the best generation of GM trucks. 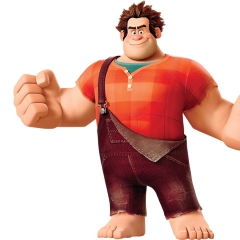 The design was clean and well-proportioned. You could easily dress it down or up and still look great. 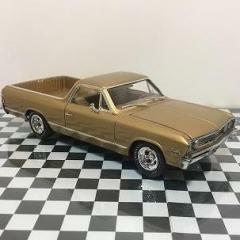 The extended cabs, crew cabs, and dually versions also had great proportions and didn’t throw the overall design off balance. They looked good right off the assembly line. Right there with you on that Cary. What I've always liked about these trucks, especially early on with this body style, is their simplicity in operation. Easy and still cheap to work on. And here we are with the assembled base engine and transmission. Believe it or not....this IS some big time progress for me. The engine looks good and the colors seem accurate to me. 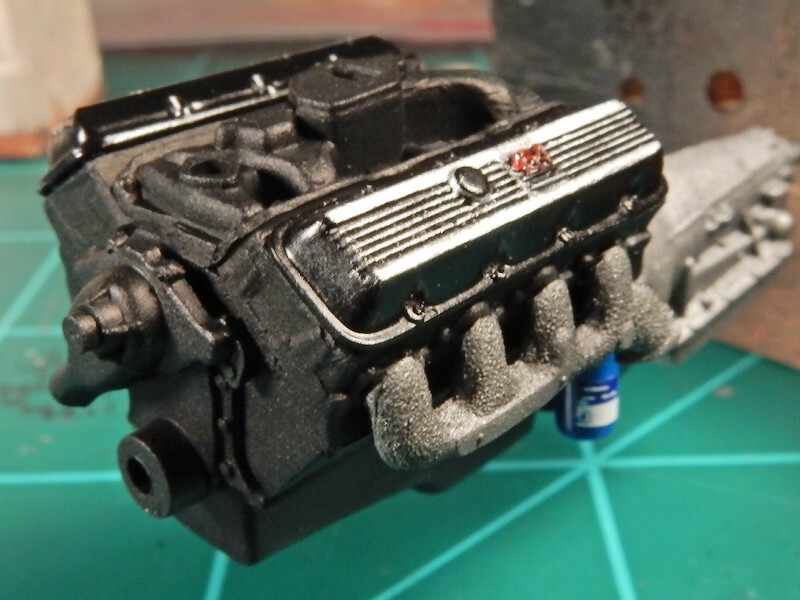 Finished the engine up over the holidays. I did a couple of tweaks to it after I thought I was done initially. I put a little droop in the ignition wires just behind the cylinder heads as they just didn't look right and that air cleaner was waaaaaaaaaaaaaaaaaaaaay too high. I shaved some off of the bottom of the air cleaner and installed at the proper height. 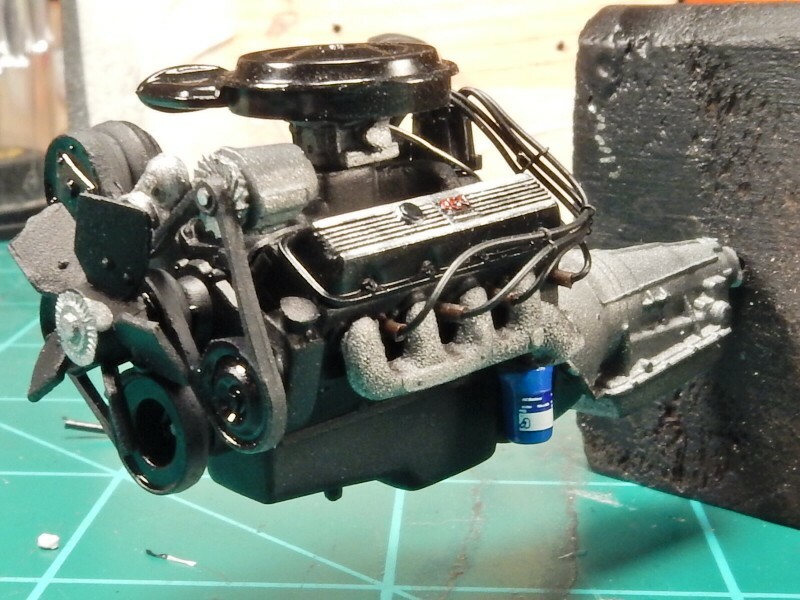 I also added an ignition coil and some fuel delivery lines. 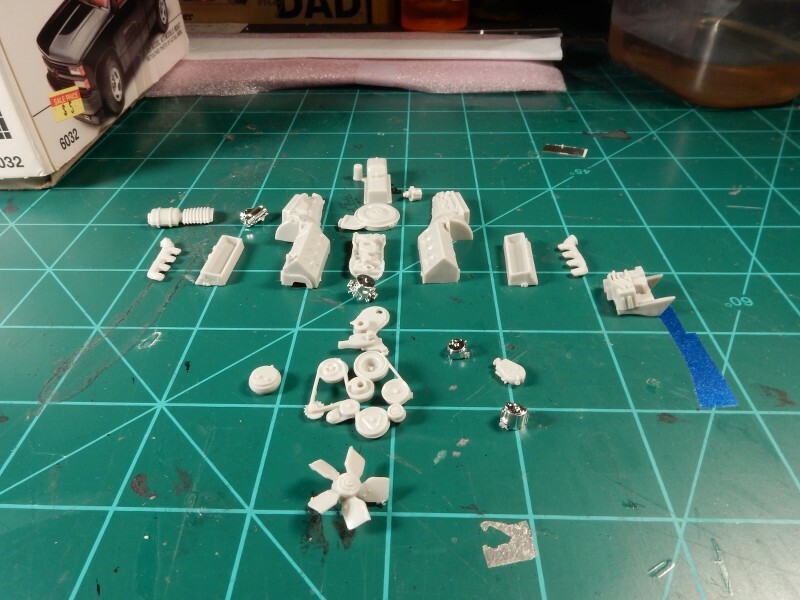 I was going to add some throttle linkage but everything I had was incorrect and it's much to intricate of detail to scratch build and get to look right so I left that part alone. There'll be an intake duct attaching at the air cleaner inlet and mounting on passengers side inner fenderwell later after the engine gets installed into the truck. Nice job on the spark plug wires. This is an area that not everyone gets correct. 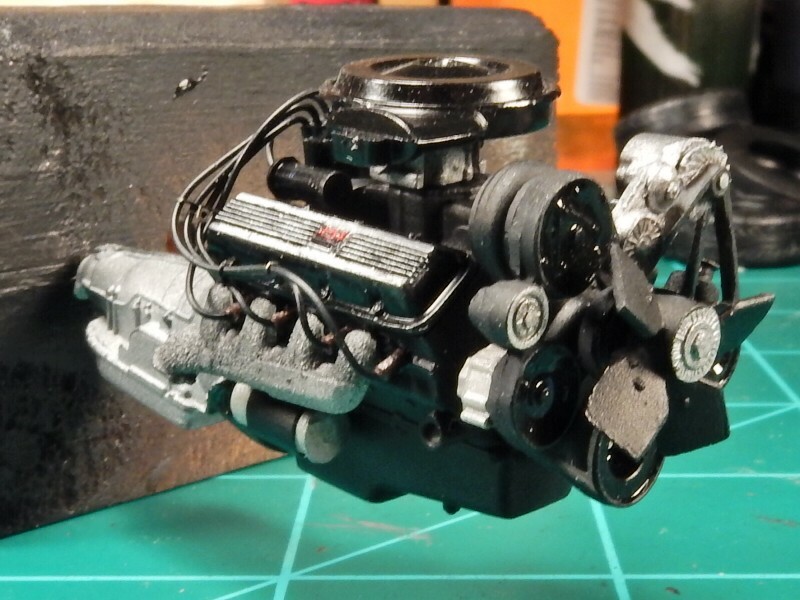 Your throttle linkage should be fairly easy since GM used a cable incased in a hard black colored casing. You could use some black wire just a ltlle larger in diameter than your plug wires and a small return spring. Drill a matching diameter hole in the firewall just to the driver's side of the relief curve in the firewall at the level of the Throttle Body base. Run what ever wire you use with a slight curve from the firewall too the base of the Throttle Body. Find something for the spring, maybe even a very slender piece of spruce and wrap some very fine wire around it. Thanks Dave! I appreciate the comments bud. There's no external throttle return spring on these TBI engines so I didn't worry too much about that one. The throttle linkage......that's a toughy for me. The following picture is one I robbed from the internet but it shows the return spring that's integrated into the throttle shaft as well as the intricate linkage/ mount assy. It also shows the CORRECT ignition coil that I've got wrong on my build. Wow Joe, that is one mighty fine looking powerplant. thought it was a pic a the real thing for a minute or two. This is a great picture to use as a guide. I'm sure you realize the orientation of the engine in the picture has you looking at it from the firewall side. In the center that you have circled what looks like a vacuum canaster that is attached to the end of the throttle cable. You had mentioned earlier about the Air Cleaner standing to tall. I'm not sure just how accurate the kits Air Cleaner is but you can see from the picture one of the reasons it does in fact sit higher than you would think necessary. GM used the spacer to raise the base of the Air Filter to clear the electronic fuel, see the white plastic tops?, and the air control towards the rear above the Throttle Body its self. Confusing stuff but as I mentioned some time ago I played with mine on my '86 C-10 years ago. While this system has all but been replaced with much better systems, Holly's new plug and drive system uses the same basic concept but much improved for the 1:1 engines.